About a month ago, I decided it was time to think about replacing my old Poseidon Cyklon 300 regulator with something a little more up to date. 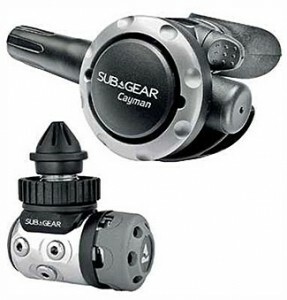 About the same time, I learned that the SubGear Cayman is actually one of Scubapro’s most popular and reliable regulators, but with a different cover. As a side note, much of SubGear’s line is, in fact, rebranded equipment from Scubapro. The XP10 dive computer, for example, is the Scubapro Aladin. Anyway, I bought a new SubGear Cayman and have been diving with it a lot for about a month. For comparison, I frequently dive with the Cyklon, Apeks XTX50 (Tek3) and Atomic T1 titanium. At first glance, the SubGear Cayman is obviously well made, and being a product of Scubapro, that pretty much goes without saying. Mine came in set up for a yoke valve, so before even leaving the store, we’d already converted it to DIN. The point there being that it is easily set up for either DIN or yoke. The SubGear Cayman has 2 high pressure and four low pressure ports located in fixed positions with no swivels or turrets. A diver using a drysuit and an octopus will max them out. That’s one for the BCD inflator, two for the second stages, plus the drysuit inflator. If you run your drysuit inflator under your right arm like me, you’ll be stuck crossing one hose from left to right. Not true if you use a safe second like Aqualung’s Airsource 3 (which I do most of the time, but not always). Next to the mouthpiece, there’s an adjustment for venturi, which provides a vacuum assist to reduce breathing effort. I find that I use it to detune the second stage to avoid a free flow at the surface, but even then, breathing is effortless, so I rarely touch it anyway. The whole thing is dry sealed for cold water performance, which is a big deal for our high elevation mountain lakes. 39 degree water is pretty typical around here, and I’ve never experienced any issues with the Cayman. I have a lot more to say about the SubGear Cayman but I am being pressed for time, so I’ll have to save that for a followup post. The bottom line is that this is a really great regulator that I am glad I bought. I’d recommend it to anyone and may buy another one to use as a deco reg. This entry was posted in New Dive Gear, SCUBA Gear Reviews and tagged diving equipment, reguator.